0.85% antimony. Cartridge casings are copper with Stinger and Maxi-Mag + V® casings nickel plated. The cartridges are loaded with flake powder for the most part though some ammunition has been loaded with flattened ball powder. The electroplated .22 LR and Magnum bullets when recovered from the body may be easily mistaken for jacketed .25 ACP bullets. .22 Short. Most contact wounds with .22 rimfire ammunition are self-inflicted wounds of the head. Hard contact wounds of the head inflicted with the .22 Short cartridge often present problems of interpretation. The small amount of powder in the cartridge and the resultant small amount of soot and gas produced result in an absence of tears at the entrance as well as very little or no deposition of soot or powder. These wounds often are mistaken for distant wounds; however, close inspection of the entrance, usually shows some blackening and searing of the edges. Distant wounds can simulate this appearance if the edges of the entrance have dried out. It is recommended, that in instances in which one cannot be sure whether the entrance wound is a hard contact or distant, that it be examined both externally and internally with a dissecting microscope for soot and powder. If on examination of a wound both externally and internally, using both the naked eye and the dissecting microscope, there is still no evidence of soot or powder and the wound is suspected of being hard contact, the wound may be examined by energy dispersive x-ray (EDX) or SEM-EDX for metallic deposits from the primer, bullet, or cartridge case. Fortunately, such problems rarely arise. Often, with hard contact wounds from a .22 Short cartridge the problem is solved immediately by the observation of the imprint of the muzzle around the suspected contact wound of entrance. 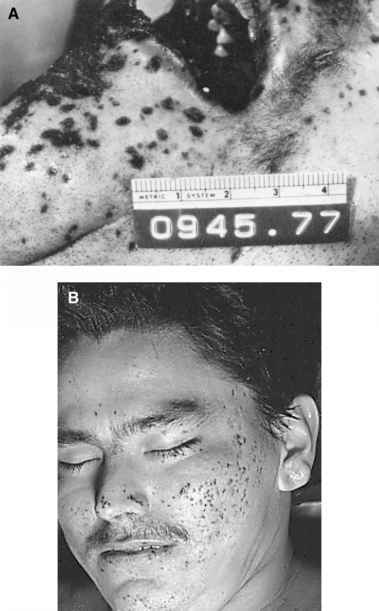 Relative absence of soot and powder from a hard contact wound inflicted by a .22 Short cartridge will be more pronounced if the weapon used is a rifle. The longer barrel length permits almost complete combustion of the propellant. In contact wounds of the head from the .22 Short cartridge, there are generally no skull fractures, except perhaps of the orbital plates. The bullet rarely exits the cerebral cavity. Internal ricocheting with such a round is extremely common. When recovered, the bullet usually is severely mutilated. Hard contact wounds of the body from a .22 Short cartridge can be identified more easily than those of the head. Because most of these wounds are through clothing, there is often a band of soot on the skin around the entrance. In all cases, the edges of these wounds are seared and blackened to a greater degree than is seen in head wounds. Soot and powder often can be seen using a dissecting microscope. These differences in comparison to head wounds may result because there is less "blow-back" of gas due to absence of bone to deflect back the gas. .22 Long Rifle and .22 Magnum Cartridges. 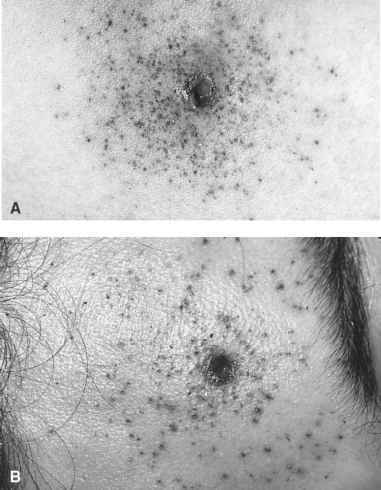 Hard-contact wounds of the head with the .22 Long Rifle cartridge range in appearance from a small circular perforation surrounded by a narrow band of blackened seared skin, to large, usually circular wounds, with ragged, blackened and seared edges. True stellate wounds are the exception, not the rule. Soot, powder, and searing are prominent. There should be no difficulty in distinguishing a distant from a contact wound with the .22 Long Rifle cartridge. The use of a dissecting microscope will reveal obvious deposits of soot and powder in the subcutaneous tissue. Muzzle imprints are much more common than in wounds from the Short cartridge because of the greater gas volume produced. Secondary fractures of the skull are frequent with fractures of the orbital plates virtually the rule. The bullet often exits the skull, though it may be found underneath the scalp, adjacent to the exit in the bone. X-ray of the head usually shows lead fragments at the entrance site and along the bullet track. However, the author has seen a number of instances of perforating .22 Long Rifle wounds of the head in which no lead was present on x-ray. Contact wounds of the head with the .22 Magnum cartridge are more destructive than those from other .22 cartridges. In external appearance, they resemble .22 Long Rifle wounds excepting that cruciform tears (stellate wounds) are more frequent. In cartridges loaded with ball powder, powder grains can transverse the head and be found at the exit. .22 Magnum bullets usually exit the head. Secondary fractures of the skull are the rule and tend to be very extensive. 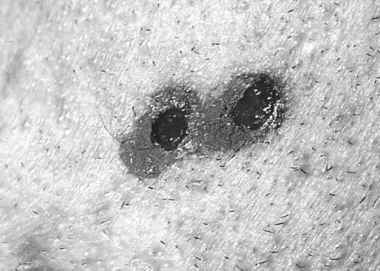 Contact wounds of the body from the .22 Long Rifle cartridge show searing and blackening of the edges of the wound, often with a cuff of soot (Figure 6.5). Muzzle imprints are common. The bullet may perforate the body in contrast to .22 Short bullets, which virtually never perforate. Figure 6.5 Two .22 LR contact wounds. There is searing and blackening of the edges of the wound. Wounds of the body caused by .22 Magnum bullets resemble .22 Long Rifle wounds. Muzzle imprints are common. If the weapon is a handgun, there are often piles of unburnt ball powder at the entrance. Exit wounds of the trunk are common. The appearance of individual powder tattoo marks, the size of the pattern, and the maximum distance out to which tattooing occurs depend on the physical form of the powder (flake, ball, or cylindrical), the range from gun to target, and the barrel length. .22 Magnum cartridges may be found loaded with ball, flake or cylindrical powder. Winchester-Western .22 Short, Long, and Long Rifle cartridges are loaded with very fine ball powder. The other three American manufacturers use flake powder though some CCI cartridges loaded with flattened ball powder may be encountered. In centerfire cartridges, powder tattooing from ball powder extends out to a greater range than that from flake powder, all other factors remaining the same. This is because a grain of ball powder has a better aerodynamic configuration than a flake. Consequently, as it travels from the muzzle of the gun, it retains its velocity better and can both travel further and impact the skin harder than a grain of flake powder of the same mass. Thus, the tattooing from the ball powder extends out to a greater range and is more prominent. In contrast, with .22 rimfire cartridges (excluding the Magnum), the exact opposite holds. This is because the balls of powder are very small and light and, consequently, have difficulty combating air resistance. In contrast, the flakes are large and dense, hence, better able to combat air resistance. They produce tattooing out to greater ranges than the ball powder. Tattooing from .22 rimfire ammunition loaded with ball powder is extremely fine (Figure 6.6A). Animal tests, using a .22 handgun with a 2-in. barrel indicate that powder tattooing from Long Rifle cartridges loaded with ball powder extends out to a maximum of 18 in. (45 cm) from muzzle to target with tattooing absent at 24 in. (60 cm). Cartridges loaded with flake powder produce fewer, larger, and more prominent powder tattoo marks (Figure 6.6B). Flakes may penetrate into the dermis. Animal testing with a 2-in. barrel .22-caliber revolver revealed powder tattoo marks from Long Rifle cartridges loaded with flake powder extend out to a range of 18 to 24 in. (45 to 60 cm). Tattoo marks were absent by 30 in. (75 cm). .22 Magnum cartridges loaded with ball powder produce very dense tattooing more like the tattooing from centerfire cartridges. Cylindrical powder produces tattooing that resembles markings from flake powder. Distant wounds of entrance from .22 rimfire bullets are generally circular in shape, measuring 5 mm in diameter, including the abrasion ring. In some areas of the body where the skin is very elastic and may be stretched when the bullet enters, e.g., the elbow, the entrance wound may be extremely small; in one case the complete diameter (including abrasion ring) was 3 mm. This wound initially was interpreted as a puncture wound and not a gunshot wound, as it was believed to be too small to be a gunshot wound. Distant wounds from .22 caliber bullets have been mistaken for ice-pick wounds and vice versa. Figure 6.6 (A) Ball powder tattooing from .22 LR cartridge. (B) Flake powder tattooing from .22 LR cartridge. commonly, both solid and hollow-point bullets, rather than flattening out on striking bone, penetrate it. On recovery, they may appear relatively intact and un-deformed. Close examination, however, will usually show fine, brushlike scrape marks on their surface. Long Rifle hollow-point bullets, fired from rifles, may mushroom without striking bone due to the increased velocity imparted to them by the longer barrel. At distant range, .22 Long Rifle bullets penetrating the head can produce linear fractures of the skull whether the weapon used is a handgun or a rifle. These fracture involve the cranial vault and orbital plates for the most part and are due to temporary cavity formation. In contrast, .22 Short wounds of the head usually do not produce fractures. If they do, the fractures are usually of the orbital plates.